i took part in an unintentional surprise party this weekend. it wasn’t originally intended to be a surprise, but as the date drew closer and closer, C realized her BF had no clue what was going on.so she ran with it. (and we all managed to keep our mouths shut.) for about an hour after the surprise was revealed, he could barely talk, so thick was his shock. i unintentionally had multiple family reunions this weekend. first with my aunt and uncle (mom’s side) on friday night. then with my uncle (dad’s side) on sunday as i drove up the east coast from philly to NJ to boston. i also got to see the new tricks Baby Mac has learned. she waves hello, goodbye, and at any other random time that she wants your attention. she does so in the most adorable way possible because she’s (a) wearing a huge grin and (b) waves backwards, so she’s actually waving to herself. and the other trick is that she can now roll from her back to her stomach. previously, she could only roll from stomach to back. i walked into my apartment (ok, fine, struggled is a more apt word) under a laundry basket and two huge bags of weekend clothes, shoes, and a laptop and turned to say hello to roommate when BOOM. i saw it. 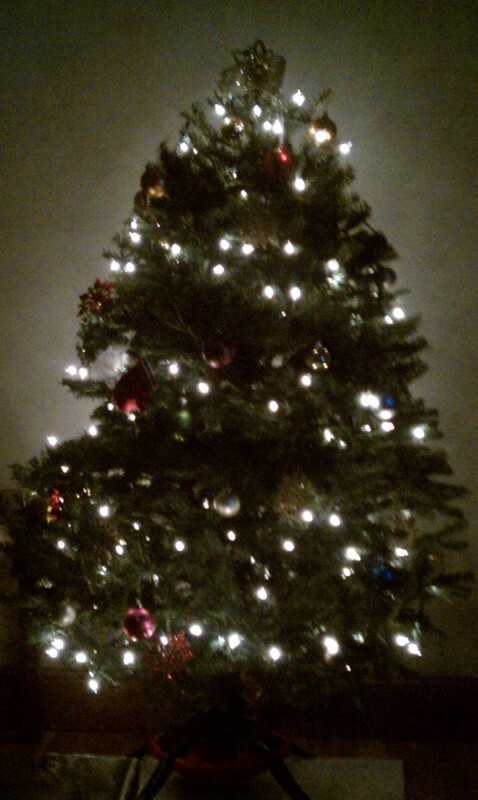 a real, live christmas tree in my apartment. roommate is a christmas fanatic and i heart the season dearly, so it’s always been surprising we don’t decorate more. maybe it’s because we each travel for the holidays and so aren’t local on the actual date or because our landlord dresses up our house so much we didn’t feel the need to add more or i don’t know, but we have never put up true decorations in our own space. however this year, roommate took it upon herself to remedy the lack of christmas cheer in our apartment. it’s amazing what a real, pine smelling, needle dropping, festive tree can do for one’s spirit. the weekend started out as me being in on the secret and ended up with me being the one surprised. This entry was posted on December 7, 2010 at 8:00 am and is filed under feelings. You can follow any responses to this entry through the RSS 2.0 feed. You can leave a response, or trackback from your own site. i had forgotten just how much realer christmas is when you add in your sense of smell. pebbsy! i love the name! and i love the double smiley. keep it coming. (TWSS). *swoon* I haven’t had a real tree in YEARS. I am jealous! Enjoy the pine scent. Merry Christmas. you can’t really tell from the picture, but it’s the size of a charlie brown christmas tree. so cute! so perfectly full! the pine scent is so fresh! my favorite part is sitting in the room with the tree as the only source of illumination. Sounds like you had a great and busy weekend. and nice tree. I haven’t had a real one in years. ah the perils of pet ownership…cat is scared of the fake tree, but a real one? he turns into a big squirrel and tries to climb them. every. single. time. good point. next time, i’ll make my blog scratch and sniff. oh, she waves to herself! that’s too adorable. i love it! it really is too adorable. it’s my mission to get a picture of it over the christmas break. Loved this post! Great structure for it, and love the full circle. SO FUN! aww, thanks Jeffe! i feel like a celebrity, what with you stopping by and commenting. it has to be said — SO FUN. my christmas goal: take a picture of baby mac waving to herself. and YES, i remember that book. i saw it in the store last year and was thisclose to buying it. i’m pretty sure our copy no longer has any scents left seeing as it’s 20 years old. what a classic. If you see that book again buy me a copy!!!! I will pay you back! I would love to have a set of all those classic books from our childhood! I will help you get that picture :) I want a copy! that’s a lot of exclamation points. you must really want a copy of that book!!!!!!!!!!!!!!!!!!! !